The Aristotelian pQ-semantics are a game-theoretical ask-answer device necessary and sufficient to generate the oppositional complexity of OG. They are a generalisation, by Moretti, of Aristotle‘s combinatorial definitions of “contradiction” and “contrariety” (which Moretti reduced, by a suited mathematical forcing, to the new structure of “Aristotelian (2 power 2)-semantics”). 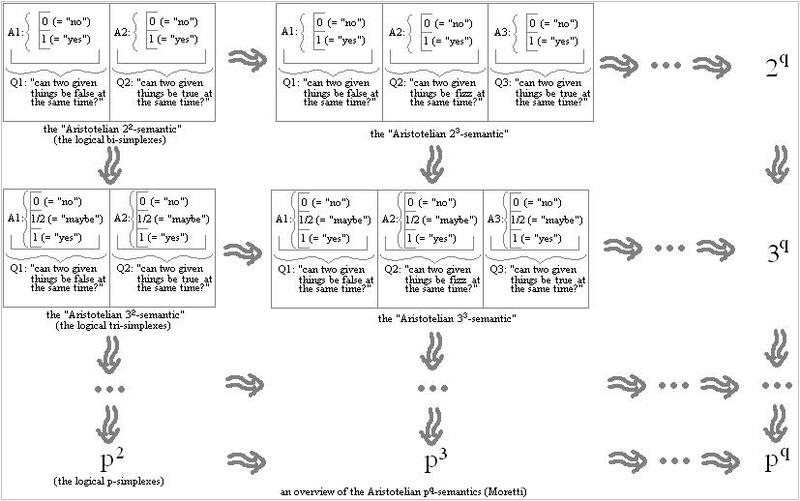 These semantics allow having Aristotelian pQ-lattices, from which all “oppositional kinds” can be retrieved. It is these semantics and lattices which, among others, allow stepping from the “logical bi-simplexes of dimension m” (to which belong the logical square, hexagon and cube) to the general “logical p-simplexes of dimension m“. …………………. | …………………. | ………………… | ………………… | … | ………………….